An estimated 350 million people worldwide suffer from one of the 7,000 different types of Rare Disease. Do you think that it doesn't affect you? You're wrong. Even if it doesn't directly affect you, if you're reading here you can no longer say that it doesn't affect you. You know Mabel. You probably know others. It affects everyone because we all have genes. We each have mutations to those genes. Are you a mom who is planning to have more children? Is that a possibility? If so, take a long look at your husband and yourself and know that within you both are genes and mutations that could possibly create a child with a rare disease or syndrome. Please don't let the thought change your mind. Have children! And embrace them fully; whether healthy or unhealthy. Sick or well. But please go into it being educated. There's no longer an excuse. Kelle Hampton said once in a video from her blog that we need to help create a world where children who are different are celebrated and not just tolerated. It's true, don't you think? What a beautiful world that would be. Did you know that many moms who had the option of knowing Mabel's symptoms prior to birth would have aborted her before she had the chance of breath? Can you imagine? I love the idea of a world where all little children know what a G-tube is and embrace it. They are not only ok with it but ask where there's is. I would love a world where people didn't stare and wonder when a child's body is moving frantically about because they lack the control to hold it still and steady. I would love a world where parents felt empowered to educate others about special needs and others would feel the urgency to act on their behalf; realizing that they too could be affected at some point. 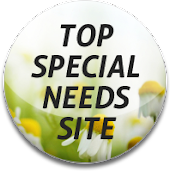 Because 'special needs' or 'sick children' are not just given to special parents or parents that can handle it. God didn't just hand pick a few select people to fill the roll. It's really more like rolling the dice. It's a gamble. Anyone could be where I am. Anyone. Rare disease affects everyone. And therefore, everyone should feel the need to act. We should all want to stand up on behalf of those that are affected because we never know when and if disease will strike. Much like death, I believe disease is no respecter of persons. Age, race, gender. Whether born within or grown into--disease strikes quickly and unexpectedly. There is no true way to escape it or even prepare for it but I believe we can educate ourselves about it and be involved in changing our society into one that is more accepting, more knowledgeable and more compassionate. These children who suffer are sisters, friends, daughters, sons, uncles, brothers, nephews, neighbors. They are sitting in the back of your church or are absent from service because it's flu season. They are loved deeply by their families and are worth your prayers, time, money and effort. For now I hope you are reading this while your 'healthy' children are running quickly through your house, not listening and being a bother. I pray that you recognize the gift you have been given in them. But only now--only after I've had to look at my own 'unhealthy' child in the face and fight away fear and anxieties that I didn't know existed. I'm begging you--please don't wait until you're affected by rare disease to stand up and appreciate what you do have and fight for what you do not. You can help us fight for Mabel and a diagnosis! By spreading the word about rare disease and helping us raise awareness, we are gathering warriors who are willing to fight with us in a battle that is long and exhausting. I can assure you that we would [will] do the same for you, if you needed [ever need] us to. For now, we are preparing for World Rare Disease Day at the end of Feb. If you work in a place that would allow you to wear jeans for a cause for one day, please consider rare disease to be that cause. Everyone can pay a dollar or a donation and the money could help go to a number of different organizations that are in this fight as well. If this is something you'd like to do, please email me [rameelin @ hotmail dot com] and I'll get you ribbons to hand out on the day along with more information. "Mabel's Able" is now officially a not-for-profit organization and we are thrilled. I'm in the process of getting a paypal set up so that we can accept donations at any time. Please help us spread the word because money raised means more children who have the hope of a diagnosis, better therapies, monetary needs being met for families, etc. These are huge things that are so close to our hearts. Rare Disease isn't as rare as we would like to think. For now, you may consider yourself blessed to not be touched by the devastation, hurt and crisis that comes with the territory. I pray that you never have to experience it. But if you do, there is hope. There are people who will stand up with you. People who will care enough to include your child and rally with you for a cause that actually means something. For us, it means everything. Please share our facebook page, "Raising Redheads" on your wall and encourage people to visit this blog. Please ask them to invite Mabel into their lives so that they will get involved too. Our little girl not only deserves life, but she deserves a diagnosis. She deserves for people to rise up on her behalf and fight. Thank you for your post- you remind me that I need to remember to not judge- and spend a little more time loving all the things about my daughters, especially the ones that make them rare and unique.